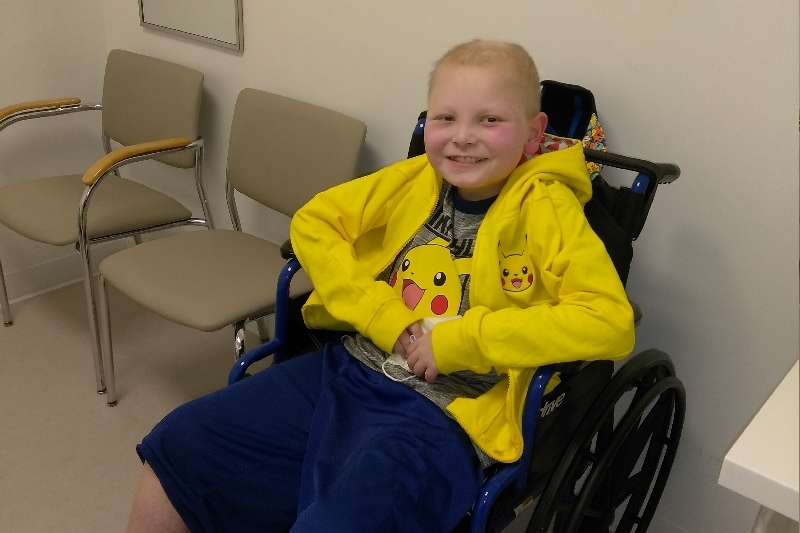 Elijah is 8 years old, he was diagnosed with and has been battling Ewings Sarcoma Cancer since May 2015. He has gone through so very much to even get to this point and even though we are extremely greatful for it we have found ourselves in an even deeper financial hole. 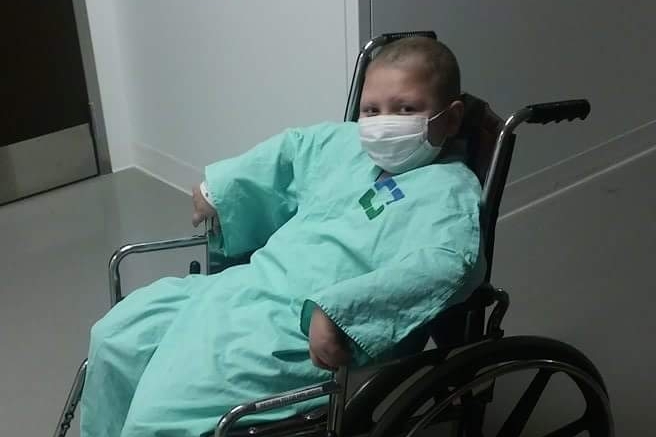 Elijah needs a stem cell Transplant and it must be done out in Children's Hospital Colorado. I his mom will be there with him 24/7 which will have costs in its own but unfortunately his dad will have to stay behind to work and keep up with our insurance that we so desperately need and our bills. He hopes to at least travel back and forth as much as possible to be there for our son in this crucial time, this will all take money we just do not have. So please we ask for any donations, everything helps and we truly appreciate it. We understand that not everyone can help financially but We also ask for your prayers, one day we believe Elijah will be Cancer Free! So just a little update, we are in a position that we don't have many options. Right now the only place Elijah can receive the treatment he needs is in Cleveland. If we can get one of the doctors back home to at least check his counts, give transfusions if needed and be there for any fevers or in an emergency we will be able to fly back and forth about every 10 days and then Elijah will receive his chemo here in Cleveland. If we can't find a local doctor to do that then we will have to stay full time in Cleveland. Either way this is going to be chaotic and expensive. We are very grateful for everyone who has donated in the past but because we are still fighting this fight daily and within two states across the US, all the funds we have collected thus far have run dry. So we again ask if you could possibly help in anyway, any amount or even just in prayer we would greatly, greatly appreciate it. It was brought to my attention that I had not updated Elijah's GoFundMe page since we returned from Cleveland in June. A lot has happened within the last few months. While we were going through the process and awaiting Elijah's transplant 9 tumors re-occured throughout his body. We were then left with the option to go ahead with transplant but because he now had active disease they did not believe that he would survive it and then if by some chance he did, there was a much higher percentage that his cancer would come right back within 3 months. This would of been very harsh on him physicaly and mentally. Our other option was to bring Elijah home, put him back on chemo, pray for a miracle or that he returned back to remission and just give him the best life we possibly could. We don't have many chemo options left and the one he was just on is not working. His new regimine will start this Thursday and we are praying with everything we got. He is on even more medications then ever before and we will continue to travel back and forth to Cleveland as needed. Any help at all is greatly appreciated and we thank you all for your prayers and support. March 11th, 2017- So we have a BIG update on Elijah's scan results and roadmap of treatment. We found out that there are 3 very small tumors on his head but we cannot even feel them, the largest is about 2cm. He also still has the tumors in his right femur and in his left tibia. To our biggest surprise those are the only remaining tumors throughout his body! They have decided to do two weeks of radiation pinpointed on those tumors and hopefully if Elijah responds to the radiation as he has in the past it will wipe those remaining tumors out and best results will leave him NED with No more tumors!! With those results he will finally be eligible for transplant! We are not sure if we will get his stem cells that were collected back in 2015 from Colorado or if he will do a whole new collection here and then jump right into transplant. The transplant is scary and has dangers all on its own but we can see that light nearing at the end of this dark dark tunnel and we could not be happier and more excited. We are continuing our stay here in Cleveland as he receives his higher dose radiation over the next two weeks and if possible go straight into transplant. We may return home for a few days with him on chemo if he does need to do a new collection or we may just stay here till everything is done, whatever is best for Elijah. That would have our stay here in Cleveland extended for the next 3-4 months. It is challenging being so far away from home, family and friends but the Cleveland Clinic is amazing and we trust his Doctors here whole heatedly. We ask you all to please please keep your prayers coming especially for these new obstacles a head and thank you so much for your continued support. We have made it this far now and Together we are going to beat this Beast called Cancer!!! WOW! Such good news! I am so happy to be going along with you and your family on this journey. Elijah is a complete joy and beautiful child. I can only imagine all that you have gone through, and can only pray Elijah's healing and the family to have strengh and endurance to take this journey with him. I delight in Elijah's wonderful smile! Your son stole my heart from the 1st day 93.3 posted his story. He is in my prayers and so is your family. Ok. Let me try that again. Please check out The Ronald McDonald House. You must apply early snd they do a background check. Sometimes it takes a while to get a space. They are a lifesaver. Good luck and God Bless you. My sincere condolences to you and your family. I have lost several loved one to cancer in my lifetime and I truly understand the impact it makes on all that love those affected by cancer. Please accept my donation with my deepest heartfelt sincerity, knowing that this does not get easier, just becomes more familiar. You touched many lives with your courage and attitude and will not be forgotten. In memory of Elijah and support for a co-worker Angelica. God bless you. With love and remembrance of sweet Elijah.